On Kangaroo Island, in Southern Australia – one of this planet’s last unspoilt natural refuges that is literally crawling with wildlife – Verve cuddles a koala, feeds a flirtatious roo, says hello to a wallaby and walks with the sea lions. 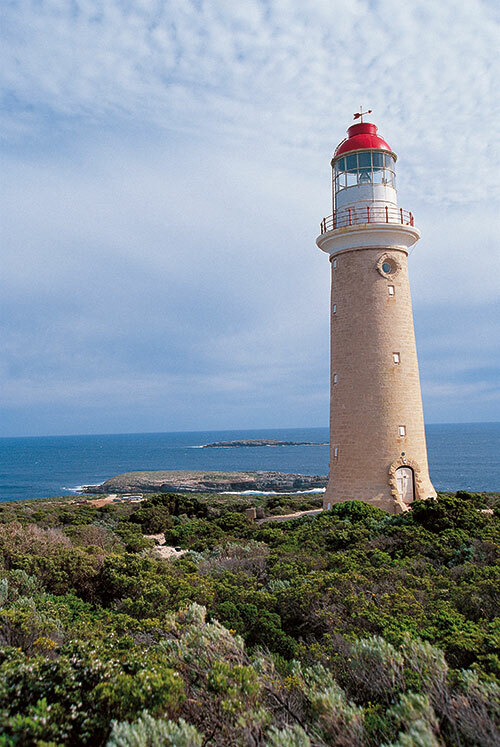 Standing tall: the lighthouse at Cape du Couedic. Sssssh, quiet please. I’m having a MGM…a ‘magically great moment’. You know the kind of moment that is so hard to come by…a moment you can’t buy for the love of money in this jaded, been-here-done-that world. So, let’s have some calm and savour it fully…. For it may never come again. I want you all to meet Angelina and Brad, two very charismatic kangaroos, whom I’m lunching with! As a bedtime story for one’s grandchildren, this experience can’t be topped. It is not a digital image on the computer, not a wine-induced colourful dream, but the real thing. Brigitte and Benedict, my two French journalist friends, are in ecstasy, mouths agape, while Angelina and Brad eat away to their hearts’ content. I can’t resist the names. 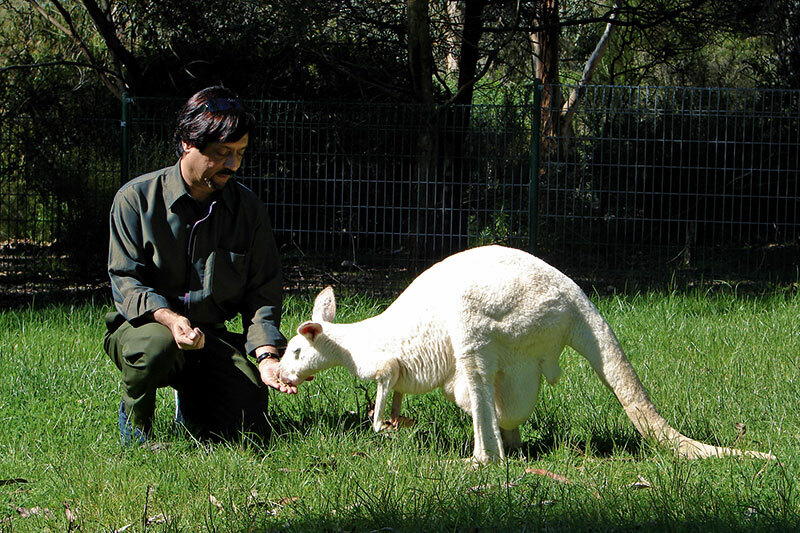 Angelina, female roo (Australian short form for kangaroo), is friendly, flirtatious and fearless. She eats the barbecued meat right out of our hands and later, even hops over to the table and reaches out for the chocolate brownies. Without a thank you, but none expected anyway. Male roo, Brad, watches warily from ten feet away, never coming close but accepting tasty morsels thrown his way. What a marvelous day this is turning out to be on Kangaroo Island, South Australia. Seven times the size of Singapore, it’s literally crawling with wildlife. And to think that it is only a half-hour flight from Adelaide! 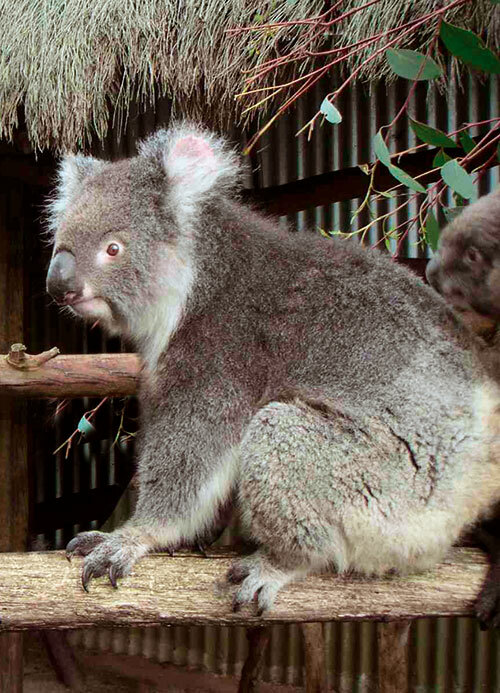 The koalas aren’t hiding – they’re relaxing at home in native trees. The seals aren’t performing – they’re lazing beside you on the beach. 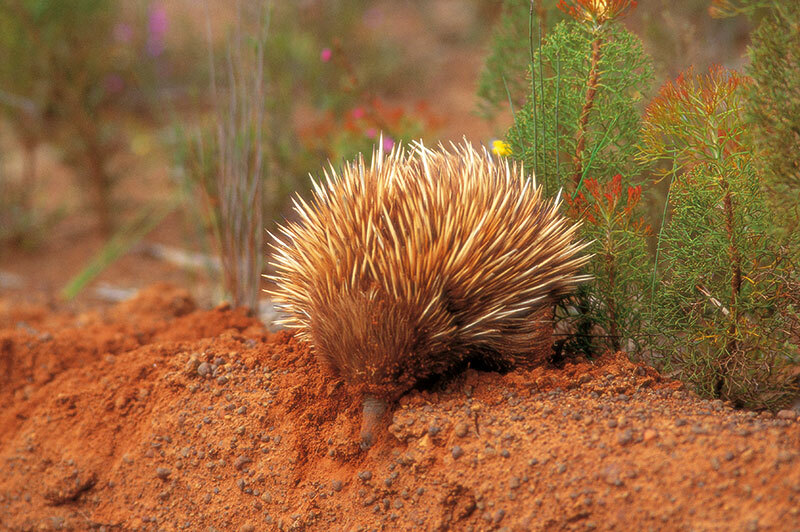 There are echidnas, platypus, goannas, wallabies and kangaroos…. All thriving, all mesmerising. Half the native bush land on Kangaroo Island remains just as it was when British navigator, Matthew Flinders, put a name to this untamed wilderness in 1802. More than one-third of the Island is National or Conservation Park. 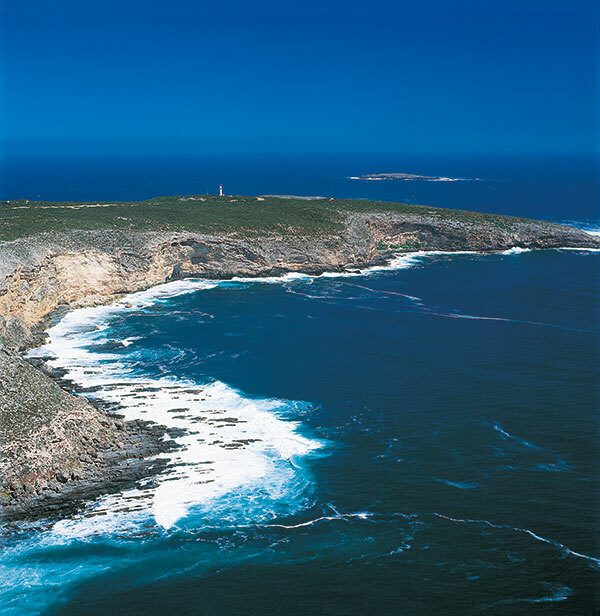 Global travellers in last year’s survey called Kangaroo Island one of the earth’s last unspoilt refuges. But, we are being thoroughly spoilt with Mother Nature’s ample charms, our greedy senses hungry for more. A two-day guided tour suddenly seems too short. Having finally eaten our lunch, in the cook-your-own-stuff demarcated areas in the Flinders Chase National Park, we wistfully bid adieu to Brad and Angelina, who are already at the next log cabin where newly arrived visitors are laying out their feast. So much for friendship! Enmity and friendship are marked characteristics in seals and sea lions. As our wildlife guide informs us, each is a different species. At Seal Bay, we walk down the cliff on to the sandy beach on guided tours. Getting up close with Australian sea lions is another vibe altogether. Each sea lion family claims its own designated area. Males will snap ferociously and make threatening noises at any intruder. Only 10,000 sea lions are left in the world and Seal Bay has the third largest colony of 600 and each one has been tagged by officials to keep track of the numbers. 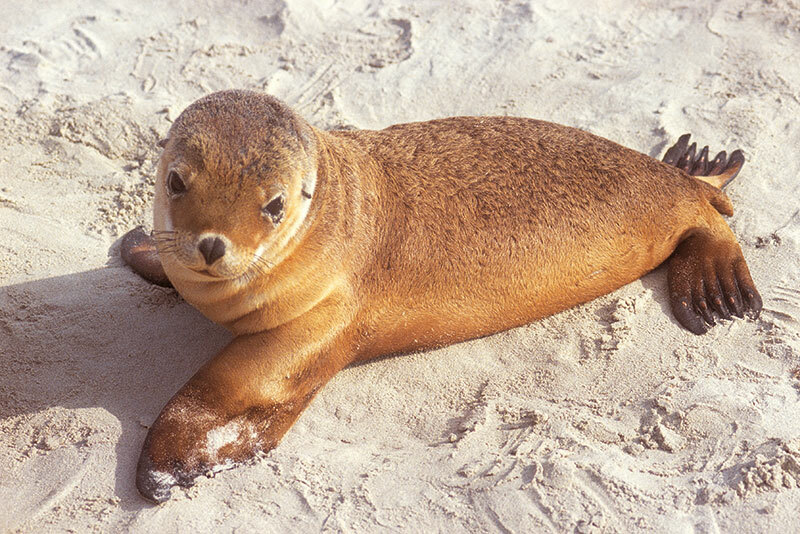 From December to February, sea lions enter the mating season, with pups being born from January to June. The circle of life is always a wonder. Hey, look! Two young pups have just surfed in, now on the sandy beach, walking on all flippers. Oblivious to human presence, they flop down five feet away, burp heartily after an obviously satisfying meal and promptly fall asleep. Our mouths are once again wide open. It’s another MGM. Sigh. Back in our four-wheel drive, we coast through the native bush land and soon arrive at the top of Cape Couedic. Whew, what a view! It stretches as far as the horizon, the infinite Indian Ocean. Small islands rise out of the aquamarine waters like stepping stones in a Zen pond. We descend the wooden steps to come close to the sea and say hello to New Zealand fur seals who look very different from the Australian sea lions whom we have just said goodbye to. More than 7000 of the fur seals live and breed here. Energetic and argumentative, these mammals jump in and out of the freezing waters with remarkable ease. Not looking at all at ease are two Swiss mountain climbers, who are trapped on top of the next tourist spot that we are exploring. The Remarkable Rocks, ten minutes away from Cape Coudic, are one of Australia’s biggest tourist draws. Huge boulders – carved by wind force over centuries – precariously balance on each other, offering great possibilities for candid camera. But I bet these two Swiss will never say cheese again. For the rocks look easy to climb onto but are strangely enough, impossible to climb down from! Since they have shown us, what not to do, I opt for the world’s most remarkable sofa. And lay me down for 40 winks. Talking of sleep, it’s not just owls who too…whoooo…too all night. It’s also the endearingly funny birds called penguins whose alarm clock wakes them up at the twilight hour! These are special ones called little penguins, found only here (and in New Zealand) and are impossible to tell apart at night. Which ironically is the best time to meet them. Trevor Jaggard, owner of the Kangaroo Island Seafront Hotel (www.seafront.com.au) in Penneshaw coastal village, takes us on a guided tour after dinner. Little penguins lead fascinating lives. Also known as fairy penguins, these nocturnal creatures will walk along with you on their way to their favourite bedroom, the local golf course. I’ve saved the best memory for last – our visit to the Parndana Wildlife Park. Located in the geographical centre of Kangaroo Island, the Parndana Wildlife Park is only 20 minutes away from the airport and 30 minutes from the largest town of Kingscote. This award-winning wildlife park is famous for its birds and is an absolutely not-to-be-missed experience. Open every day of the year, this park is where people and animals meet face to face. Here, you can hand feed kangaroos, say hello to wallabies and emus, exchange squawks with yellow tailed cockatoos, watch echidnas sleep and even cuddle a koala. I do… cuddle a koala. I’m in MGM heaven. From Adelaide Airport, Kangaroo Island is a 30-minute flight by scheduled air service to its largest town, Kingscote. Qantaslink (which also operates direct flights from Melbourne) and Regional Express (REX) are two airlines that fly you there. There is a daily passenger/vehicle ferry service. First, get to Cape Jarvis (a 90-minute drive from Adelaide) and take the 50-minute ferry to Penneshaw on Kangaroo Island. There is no public transport/taxi service on the island. Four-wheel drive vehicles are not necessary for travelling on the island. Vehicle hire is available in Kingscote, Penneshaw and the Kangaroo Island Airport. Book these in advance in Adelaide, if you want to drive around. Accommodation ranges from boutique and heritage houses to service apartments and hotels. Recommended are Acacia Apartments, Kangaroo Island Seafront Hotel, Seafront Hotel, Kingscote Pier. Some tour companies will take the hassle out, pick you up in Adelaide and give you guided tours and bring you back with a smile. Recommended: Sealink, KI Wilderness Tour, Gray Line. Not surprisingly, fresh seafood features prominently at the island’s many cafes, restaurants and hotels. Local wine is good.